Following through on New Year's resolutions requires a tremendous amount of self-motivation -- and if you were that tremendous, you wouldn't need to make so many resolutions in the first place. 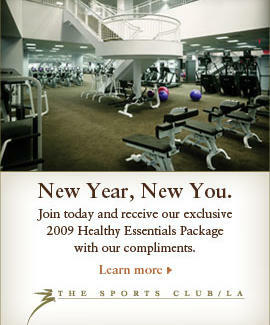 Here to provide an assist -- in fitness, and life -- The Sports Club/LA. The Sports Club/LA's an expertly staffed leviathan of healthy living: 127,000 sq ft, with 110+ classes weekly, hoops & volleyball courts, boxing, and a 25-yard pool, plus a 40-cycle Rev studio, spa, lounge, and more. Right now, they're offering Thrillisters a comp one-week All-Access Pass. Join up, and they'll also comp two private training sessions, a nutritional assessment, and a spa session upgrade, and knock 75% off your initiation fee and cover your January balance -- an offer so generous, you will want to hug them, but hopefully not 'til after you've taken a shower. Broaden Your Investments: EmergInvest EmergInvest provides comprehensive breakdowns on 125 global markets, giving you the skinny on everything from Namibian Non-Cyclicals to Icelandic Pharmaceuticals -- which, like the country, are not hot. Pick Up Your Golf Game: Play Golf Designs Available anywhere in the US or Canada, PGD will set up your crew with one of their stable of attractive female instructors, whose experience ranges from NCAA to LPGA, and whose hotness ranges from "Sexiest Golfer of the Year" to "Sexiest Golfer in the World". So that's who beat you out. Be More Social: Sorry I Missed Your Party This ruthlessly entertaining photo-blog posts Flickr's most jaw-dropping party pics, from classic "multiple dudes in hot tub" shots, to a yawning strumpet grinding on a man doing the robot with a parrot perched on his wrist, to a cat licking whipped cream off a guy wearing a gas mask (allergic to cats, but not allergic to fun!). The complimentary one-week membership must be activated on or before January 26, and to get the 75% off initiation you've got to sign up for a Regular Health Membership on or before the 31st. If you haven't started on "Get in shape!" by then, you've probably resolved to wait 'til 2010.